We sincerely apologize for any inconveniences this postponement causes, but do hope you join and celebrate with us in October. 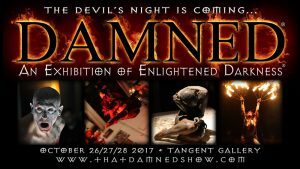 Hosted at the Detroit’s Tangent Gallery, Corpus Illuminata consists of equal parts exhibition, academia and bazaar. The exhibition portion will feature over 90 artistic interpretations from artists local and across the nation. On stage, various speakers will present and discuss a variety of topics of intriguing subject matters. And within the Corpus Bazaar, collectors of medical antiquities, oddities and related handicrafts will present their unique offerings for sale and/or trade. 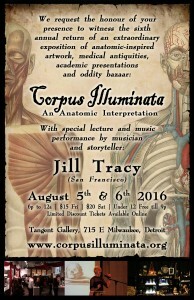 Returning for 2016, Corpus Illuminata is proud to welcome back composer, musician and storyteller JILL TRACY (San Francisco), whose dark seductive music has appeared on CBS, NBC, PBS, numerous independent and feature films, and was used by Showtime as the “Final Requiem” to promote the wildly anticipated last season of Dexter. 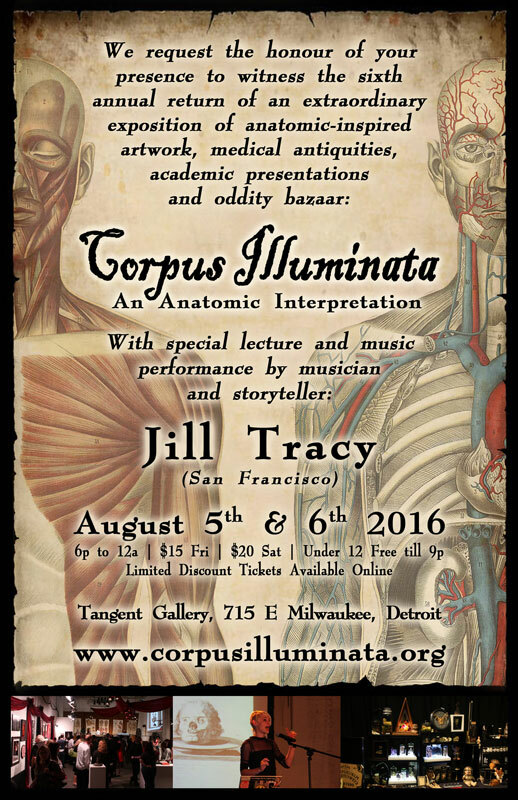 On Friday August 5th, Jill Tracy will present first-hand spirit accounts and rare historical photos inside the now-demolished Letterman Hospital, the abandoned Psychiatric Ward, forgotten attics, and secret cemeteries. Sightings of ghostly soldiers and shadowy souls, looking for lost loves, and lost limbs. 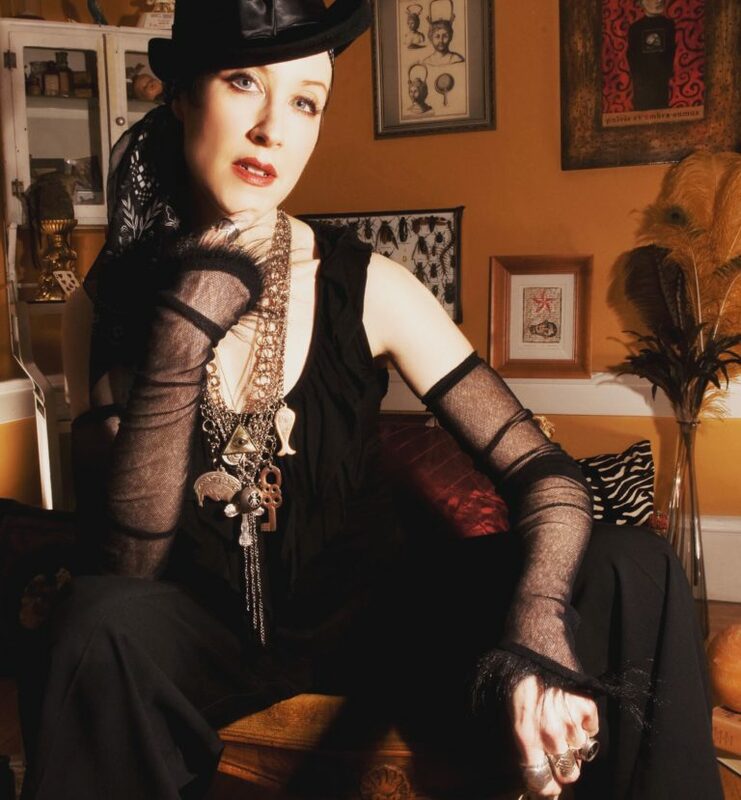 Then on Saturday August 6th, she will close the exposition with a full-length concert amidst the anatomic/medical-inspired artwork, which will include piano music composed in the Presidio inspired by her findings. Limited seating will be available. The overall event begins at 6pm until Midnight on the 5th and 6th of August 2016. All ages are welcome, however discretion must be advised due to graphic medical content. Those under 18 Years must be accompanied by a parent or legal guardian. Advance tickets are now available online for $15 and $20. Children 12 years and under are free until 9pm. The full schedule of lectures and performance time will be available before August 1st. For the latest updates, subscribe to the Corpus Newsletter or follow us on Facebook or Google+ or Twitter.